SpotKote Matte can sometimes have more impact on the graphic design than gloss pending the use of your colours. 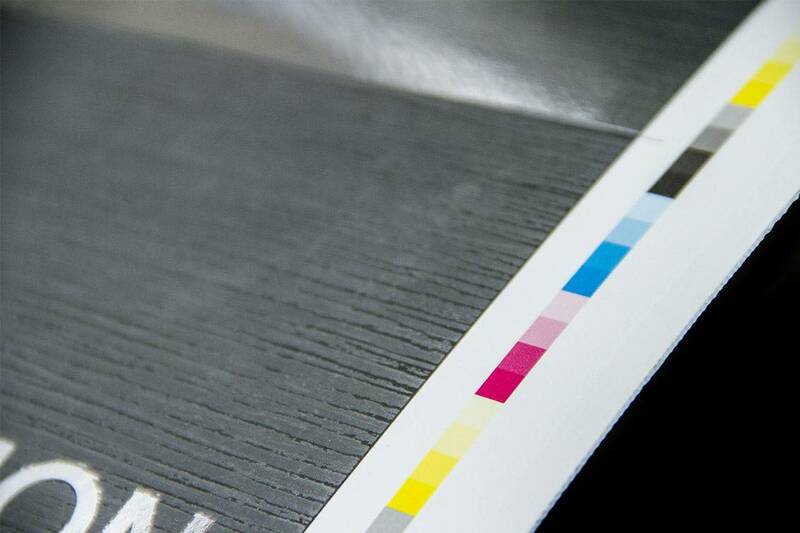 So think of SpotKote Matte when wanting to provide contrast between a glossy surface and a normal printed surface. This unique product also adds a different texture feel to your printed surface. Clever uses of Matte SpotKote have been in conjunction with our gloss lamination KeyKote. The glossy surface provided by KeyKote allows Spot Matte to highlight darker images, shapes or patterns in your design offering amazing contrast. Anything is possible. Add some stripes, circles, waves, textures or prints. The variations are endless why not add FoilKote or an Emboss what about BubbleKote to just finish off that amazing design piece. Please provide a marked up sheet showing your grip and lay. Remember Spot MatteKote is a screen process so avoid any scores, folds or trims as it will crack. For best results allow SpotKote Matte to finish short of these areas and if you are unsure contact your Allkotes team as we are only too glad to give advice in these situations. A 20 mm grip is a strict requirement, so from the grip edge to the first image requiring Matte Spot, a 20mm gap is required. It’s a good idea to de-dust your job before sending to Allkotes. We will require a film positive right reading emulsion up or a PDF outlining the area/s to be coated. Ensure your inks are dry before we coat or laminate otherwise set off, scuffing and marking can occur. The SpotKote Matte process involves heat in the curing process so please allow time for the Matte Spot to cool down before despatch. We strongly advise against trying to process straight after the Matte Spot process as set off, softening of inks/varnishes and picking can occur. Two-sided work requiring Matte SpotKote needs to be discussed with Allkotes team before proceeding with your printing. Its best discussed at the concept stage as this product when backing up an image on an image has the potential of blocking or sticking together. Its advised that large areas of Spot Matte be avoided when planning your next job as scuffing or marking can occur when being handled. Don’t apply any varnish, primer or aqueous varnish unless it’s approved by your supplier for the coating or lamination process. Avoid the use of excessive spray powder as this will affect the overall quality of your job. The Spot process requires a constant grip and lay for best results avoid trimming your sheets prior to this process. Never double stack or leave wrapped your Spot Matte work as blocking or set off can occur.